Wondering also if they will change but not making the return conditional on that change because they do not believe they deserve any better. What love do you think you deserve? How is this matched by your reality? Who is in your life and how do they reflect your sense of self-worth back to you? The real truth is that we are all worthy of unconditional love and there is nothing we need to do to prove our worth. Once you realise your worth, you learn to shut the door firmly behind abusive and toxic people. You know that they are not your only chance of love. In fact, you know that love looks nothing like the counterfeit you experienced in the past. The Tarot can help you understand what you think you deserve (card 1) and also why this is (card 2). Pull two more cards – one to show you what romantic love is currently mirrored back to you (card 3) and what you can do to improve your situation (card 4). 2. 2 of Pentacles – You have reached this conclusion based on the concept of equality within the relationship. You know that it is possible to work together to achieve balance. 3. Ace of Swords – This reality is reflected back to you in the form of new ways of communicating. 4. 4 of Pentacles – You can improve the situation by making sure that you have firm and healthy personal boundaries in place, while facing any fear of intimacy as soon as it arises. 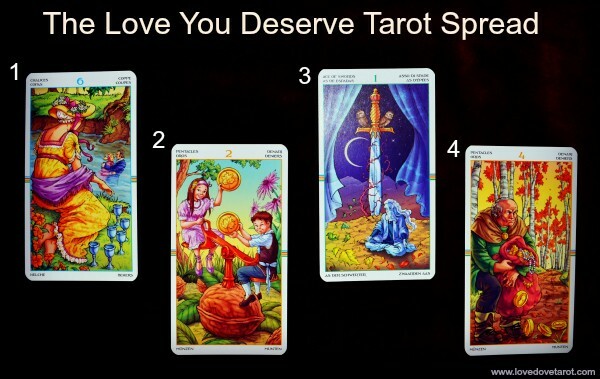 Let me know how you go in the comments below if you decide to give this spread a whirl!